There seems to be some disagreement over the exact number of vehicles involved (only 9 or was it 10?) after the driver losing control and crashing into many other vehicles, in some cases obviously totaled. The driver was driving an extremely heavy, large SUV when she presumably lost control, possibly due to a “medical incident” and presumably tromped down on the accelerator instead of the brake. 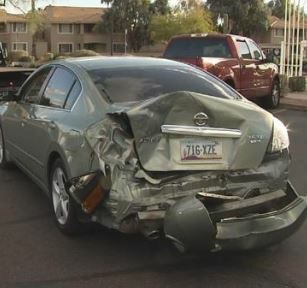 These incidents are generally considered “non-traffic”; even when they involve serious injuries and fatalities, like when an elderly driver drove into a Spa Pima in Gilbert killing 1 and seriously injuring others… so they don’t “count” statistically as traffic crashes.